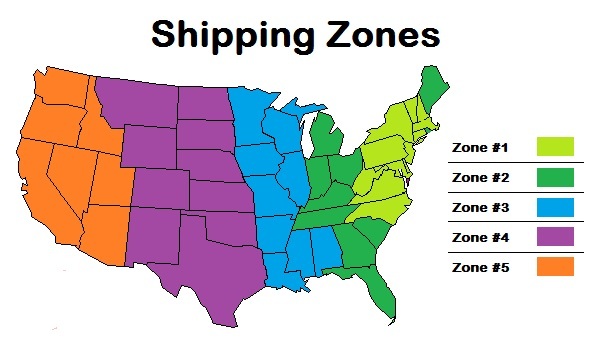 Shipping is divided into 5 shpping zones. A map of the 5 zones is below. Items weighing under 150lbs ship via UPS Ground. Many items weight 50lbs, if you are ordering 300lbs or less (for example, 6 50lb items), your order will ship via UPS Ground. Orders exceeding 300lbs will ship via freight. Quoting freight online is a tricky process but we've nailed down most rates into the zones below. Still if you feel a price is significantly higher or lower than it should be feel free to email or call us and we'll double check the freight quote for you. We aim to keep shipping as accurate as possible. We often ship freight via Con-Way and we do get a discount due to the volume shipped. If you are ordering via freight and would like to use your own carrier please call 866-561-9932 and place your order via telephone.